Mohammadmoradi, Asghar, Abdi Ardekani, Hojjatollah, Japalaghi, Gholamreza. (1396). The Necessity of Conservation and Restoration in Modern Axiological Approach to Historic Monuments. معماری و شهرسازی آرمان شهر, 10(20), 27-33. Asghar Mohammadmoradi; Hojjatollah Abdi Ardekani; Gholamreza Japalaghi. "The Necessity of Conservation and Restoration in Modern Axiological Approach to Historic Monuments". معماری و شهرسازی آرمان شهر, 10, 20, 1396, 27-33. Mohammadmoradi, Asghar, Abdi Ardekani, Hojjatollah, Japalaghi, Gholamreza. (1396). 'The Necessity of Conservation and Restoration in Modern Axiological Approach to Historic Monuments', معماری و شهرسازی آرمان شهر, 10(20), pp. 27-33. Mohammadmoradi, Asghar, Abdi Ardekani, Hojjatollah, Japalaghi, Gholamreza. The Necessity of Conservation and Restoration in Modern Axiological Approach to Historic Monuments. معماری و شهرسازی آرمان شهر, 1396; 10(20): 27-33. 2Assistant Professor of Architecture, Faculty of Art and Architecture, Shiraz University, Shiraz, Iran. Any monument that is deemed competent for conservation and restoration, is bringing the values of their creation time and then. Thus with any work which is conserved and restored, in fact, the culture and civilization is maintained. Because of the intrinsic link between “history” and “conservation”, it is necessary to reflect on related factors to the restoration, and the importance and necessity of it. When it comes to art and history, logical necessity requires the third factor; humans who formulate the subject and are the creator of art piece and history. Thus, the concern of this investigation is analyses of the cognitive value of history and the layering effect of these three factors interacting with each other. The method of the present study is the cognitive value analysis of historic monuments based on philosophical and logical arguments. In addition to these two categories, the historical values are also considered and then their relationship is discussed and evaluated. As much as the human considers an ontological and epistemological value for himself, he can consider it for others. The manner by which human comprehends his existential and noetic values, defines the way he understands the outside world and therefore the value position of history and the piece of art is confirmed. It must be understood what is the perception of people (either experts or ordinary ones) from themselves and their surroundings when they are standing in the courtyard of a historic mosque or in the area of an ancient city. As long as this question is not answered correctly, not even a step forward can be taken towards the understanding of the current conditions of architectural restoration and conservation. Akbari, M., Hoseini, M. (2009). Axiology in Aristotelian Philosophy, Research Journal of Islamic Philosophy and Theology, 20, 95-121. Ayvazian, S. (1997). Preserve the Value of Traditional Architecture, in Contemporary Architecture of Iran, HONAR-HA-YE-ZIBA, 1(2), 43-51. Berman, M. (2007). All That Is Solid Melts Into Air; Experience of Modernity, (M. Farhadpour, Trans.). Tehran: NASHR-E-NO Press. Brandi, C. (2008). Theory of Restoration, (P. Hanachi, Trans.). Tehran: University of Tehran Press. Feilden, B.M. (2003). Conservation of Historic Building, Oxford: Architectural Press. Feilden, B., & Jokilehto, J. (2003). Evaluation of Conservation, (B. Moallemi, Trans.). Haft Shahr Journal, 1(12-13), 17-23. Hojjat, M. (2001). Cultural Heritage in Iran: Policies for a Muslim Country, Tehran Cultural Heritage Organization Press. Hunter, M. (1981). Preconditions of Preservation, in D Lowenthal, B. Marcus (eds. ), Our Past Before Us: Why Do We Save It, London: Temple Smith. Jokilehto, J. (2007). A History of Architectural Conservation, (M.H. Talebian, & Kh. Bahari, Trans.). Tehran: Rouzane Press. Khatami, M. (2007). Speeches Reported in the Phenomenology of Art, Tehran: Academy of Arts Press. Mehdizadeh Saradj, F. (2011). Prioritization of Historic Buildings Based on their Value, International Journal of Architectural Engineering and Uraban Planning, 21(1), 17-26. Mohammadmoradi, A. (2002). Research Projects: Restoration’s Theoretical Foundations since the Bureau of Investigation Established to the Islamic Revolution, Tehran: Iran University of Science & Technology. Salehi Sourmaghi, N. (2014). 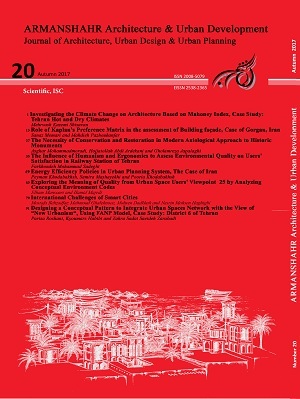 The Importance of Values Assessment in Regeneration, Sarvestan eMagazine, 1(6), 27-32. Safamanesh, K & Monadizadeh, B. (2003). Principles of Valuation Old Buildings and Fabrics, Haft Shahr Journal, 1(12-13), 17-23. Stubbs, J.H. (2009). Time Honored: A Global View of Architectural Conservation, Hoboken: John Wiley & Sons, Inc.
Tabatabaee, S. J. (2003). Reflection on Iran (Prefatory on Iran’s History of Degeneration Theory), Tehran: Negah-E-Moaser Press.